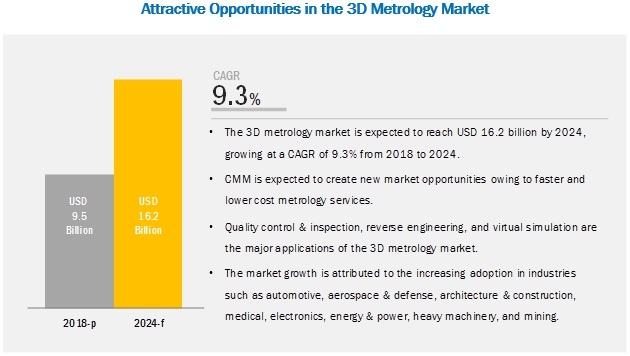 [148 Pages Report] The 3D metrology market was valued at USD 9.5 billion in 2018 and is expected to reach USD 16.2 billion by 2024, at a CAGR of 9.3% from 2018 to 2024. The major driving factors for the 3D metrology market are the highly accurate inspection owing to 3D data for modelling and analysis, focus on quality control, and increase in R&D spending.However, lack of expertise to efficiently handle 3D metrology systems and high cost incurred for setting up the 3D metrology facility are expected to limit the growth of this market. Increasing adoption of 3D metrology equipment in industries such as aerospace & defense, automotive, architecture and construction, medical, electronics, energy & power, and heavy machinery to maintain product quality is the major driver for the growth of the hardware market. Also, the growing market for CMM drives the growth of hardware offering in the 3D metrology market. CMM is required in the automotive industry for inspection, measurement, and quality checking of various components. High precision and accuracy in measurement can be achieved by a CMM. Increased flexibility, reduced set-up time, improved accuracy, and enhanced productivity are the major advantages of a CMM over conventional gaging methods. Hexagon provides metrology solutions through its Manufacturing Intelligent division. The company captured a market share of 13.9% in 2017. Hexagon caters to customers in various end-user industries, including aerospace, agriculture, automotive, infrastructure and construction, metal and mining, power, and safety and surveying. The company provides its customers fully control manufacturing solutions that rely on dimensional precision, ensuring that products manufactured precisely conform to the original product design. Moreover, the company also provides after-sales services to its customers. The key strategy of the company includes the launch of new products, along with the development of new technologies and solutions. The company prominently adopts products launches as its main business strategy to widen its customer base and increase the overall business revenue. For instance, in March 2017, the company launched a new camera-based portable CMM for highly accurate shop-floor measurements. Moreover, the company adopts acquisition strategy to expand its business, in terms of technology, and customer base. In March 2017, Hexagon Manufacturing Intelligence released a new camera-based portable CMM for shop-floor measurements with high precision. The camera detects geometric conditions and changes in 3 dimensions to deliver highly accurate measurement data. In June 2017, Hexagon launched Intergraph Smart Digital Asset (SDA) Collaboration Module for industrial facilities. The adoption of SDA Collaboration would help customers increase efficiencies, resulting in significant savings on the total project and handover costs. In March 2018, Mitutoyo America Corporation announced MCOSMOS V4.2 metrology software for Mitutoyo coordinate measuring machines. MCOSMOS by Mitutoyo is a proprietary metrology suite of inter-related modules and dedicated expansion modules for Microsoft Windows. In September 2017, FARO launched FARO Visual Inspect for inspection and design purposes. This product enables the transfer of large, complex 3D CAD data to an iPad, which is then used for mobile visualization and comparison with the real-world conditions. Which are the major applications of the 3D metrology market? How big is the opportunity for their growth in the developing economies in the next 5 years? Which are the major companies in the 3D metrology market? What are their major strategies to strengthen their market presence? Which are the leading countries in the 3D metrology market? What would be the share of North America and Europe in this market in the next 5 years? Where will all these developments in the 3D metrology market take the industry in the mid to long term? What are the upcoming industry applications for 3D metrology? The study involved 4 major activities in estimating the current size of the 3D metrology market. Exhaustive secondary research has been conducted to collect information about the market, the peer market, and the parent market. Validating findings, assumptions, and sizing with industry experts across the value chain through primary research has been the next step. Both, top-down and bottom-up approaches have been employed to estimate the complete market size. After that, market breakdown and data triangulation methods have been used to estimate the market size of segments and subsegments. The research methodology used to estimate and forecast the 3D metrology market begins with capturing data on revenues of the key vendors in the market through secondary research. This study involves the use of extensive secondary sources, directories, and databases such as Hoovers, Bloomberg Businessweek, Factiva, and OneSource to identify and collect information useful for the technical and commercial study of the 3D metrology market. Moreover, secondary sources include annual reports, press releases, and investor presentations of companies; white papers, certified publications, and articles from recognized authors; directories; and databases. 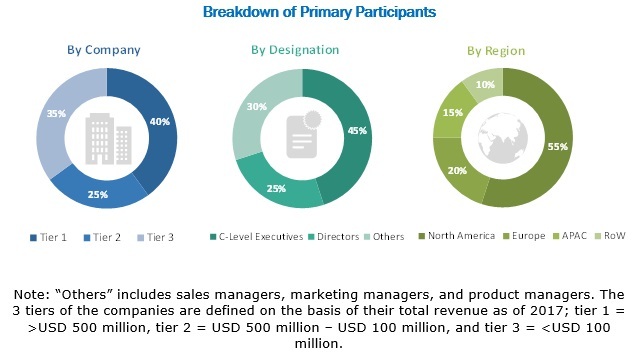 Secondary research has been mainly done to obtain key information about the industry’s supply chain, the market’s value chain, the total pool of key players, market classification and segmentation according to industry trends, geographic markets, and key developments from both market- and technology-oriented perspectives. In the primary research process, various primary sources from both supply and demand sides were interviewed to obtain the qualitative and quantitative information relevant to the 3D metrology market. Primary sources from the supply side include experts such as CEOs, vice presidents, marketing directors, technology and innovation directors, application developers, application users, and related executives from various key companies and organizations operating in the ecosystem of the 3D metrology market. After arriving at the overall market size using the estimation processes as explained above, the market was split into several segments and subsegments. To complete the overall market engineering process and arrive at the exact statistics of each market segment and subsegment, data triangulation and market breakdown procedures have been employed, wherever applicable. The data have been triangulated by studying various factors and trends from both demand and supply sides. This report categorizes the 3D metrology market based on offering, product, application, end-user industry, and region.